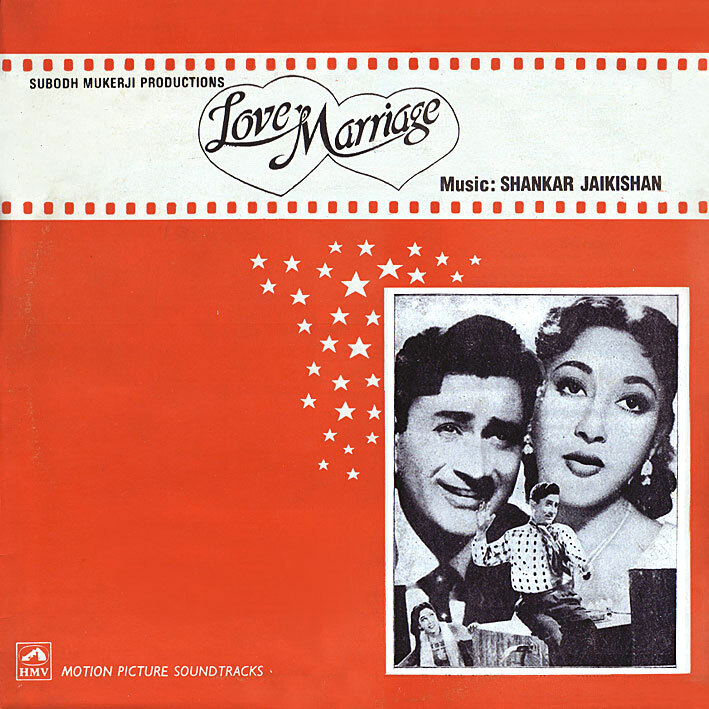 I don't know exactly when Shankar Jaikishan started employing rock'n'roll stylings in their music - the results of which they are rightfully revered for today, in the West anyway - I would suspect however that 1959's 'Love Marriage' was quite an early outing. And a good one at that. Take 'Tin Kanshtar Peet Peet Kar'. Groove to the wild, manic beat, horns honking, guitars twanging, people yelling and clapping and (I would imagine) bouncing about like there's no tomorrow. And where have we heard that drum intro before? (Or since, if we're going to be chronological?) Quintessential S-J. After a few minutes there's a change of pace, things simmer down a bit and the track gradually turns into something more traditional sounding; it's still good though. As is 'Karib Aao', my other favourite here. A lively, summery beat, loads of cool instrumental details, and Geeta Dutt again... lovely! Add to that a fun Lata/Rafi duet, a trippy sounding Title Music... and you've got what amounts to a much recommended score. "Dil Se Dil Takraye" is picturized on the lovely (and v. young) Helen :-) (you might already know that)...it's a nice movie and a lovely soundtrack. I really love that these vinyl soundtracks include things like "Title Music" which is sadly lost on later CD versions. That drumbeat reminds me of a couple of songs, but the one I think it most resembles is "Jan Pahechan Ho" from Gumnaam, which you've uploaded earlier... coincidentally another S-J score. I guess they must've really liked starting off this way! Thanks for the upload, PC. Exactly :-) Pretty much identical I'd say. And yeah, the generically entitled instrumentals are often the hightlights I think. Hey y'all, I figured out that here are some real indian music pro's. Please peep the video on the link, skip to 5:52 min. Whats the name of that AR Rahman track and which movie is it from? Big A , interesting clip so what is the bollywood film shown at 1hr 16 mins onwards , anyone ..PC , Deewani , Harshi ? big-a: I know the Hindi version of the song - "Roop Suhana Lagta Hai" from the movie "The Gentleman" (1994), video here... turns out this is a remake of a Telugu movie with the same name released a year earlier, and that song was originally called "Kontegaadni Kattuko" in the Telugu version. reza: The movie is "Suyamvaram", a Tamil film. Here's the same song on YouTube. Thanks a lot once again for a great album by S-J !. Hey just wanted to say thanks from me to you. It amazes me the amount of time some bloggers put into their blogs with ripping records and writing reviews and things. Im going travelling soon and will be without a computer so I know im going to miss a lot of posts but I hope when I come back your blog is still here. where r u pc - long time no post???? i´m on holiday :-) new posts next week. have a gr8 holiday - come back and roack as always! Thanks as always :) Enjoy your travels.